The news reports are alarming: Merely being in a room or in close contact with fentanyl, an increasingly popular opioid narcotic, can poison you, they say. 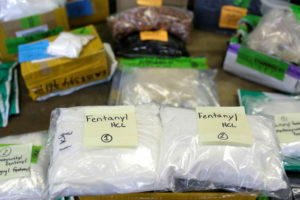 Reports of fentanyl-related passive toxicity has led to the release of hyperbolic warnings and burdensome recommendations by Drug Enforcement Administration, including the use of extensive personal protective equipment, such as gloves, paper coveralls, eye protection, and even particulate respirators. We believe that such responses to passive casualties from fentanyl are excessive and may actually interfere with the ability of first responders and others to do their jobs. In 2018, Massachusetts became the first state to ban from the courthouse evidence that may contain fentanyl or carfentanil (an extra-powerful fentanyl analog) out of concern that these substances are too dangerous to be in public places. In Pennsylvania, Gov. Tom Wolf made a dramatic declaration to “ensure the safety of corrections personnel” by implementing expensive new processes and technologies to prevent further drug exposures in prison. This came in response to an unproven exposure to a drug smuggled into prisons in Pennsylvania and Ohio that “sickened” more than four dozen prison guards. All of these moves appear driven by concerns about the perceived risk of passive exposure to synthetic drugs, especially fentanyl and its analogs, by law enforcement personnel and first responders. Although mitigating risk is laudable, the risks of transient exposure have been blown out of proportion by media coverage. One of the issues with this dramatization of fentanyl toxicity is that it further stigmatizes substance users as contagious and dangerous. That can potentially delay care to those who need prompt rescue and treatment. This trepidation is reminiscent of the fear of caring for people with HIV in the 1980s. There is clear evidence that passive exposure to fentanyl does not result in clinical toxicity. Descriptions of the signs and symptoms of those who have supposedly experienced passive toxicity vary widely. They include dizziness, blurry vision, pallor, weakness, sweatiness, high blood pressure, chest pain, heart palpitations, anxiety, and occasionally seizure-like activity. These findings are usually transient and resolve on their own, often far faster than would be expected, and are incompatible with the known duration of the drug’s effect. What’s more, they aren’t consistent with the signs and symptoms of opioid poisoning — the triad of slowed breathing, decreased consciousness, and pinpoint pupils. Testing of biological specimens, though performed in very few cases, has been nearly uniformly negative for the presence of fentanyl. The positive response to naloxone that is occasionally seen among those with passive toxicity is likely due to the noxious effects of its intranasal administration. It’s also important to put into context the practical risk of exposure to fentanyl. Pharmacists have been working with fentanyl for years, without reports of passive exposure. The same holds for surgeons, anesthesiologists, emergency physicians, and others working in operating rooms and emergency departments, where fentanyl is routinely administered as a pain reliever. Doctors, nurses, and others in emergency departments who care for victims of fentanyl overdose are undoubtedly exposed to these drugs on patients’ clothing, skin, and paraphernalia. Workers in needle exchange programs and supervised consumption facilities are routinely exposed to the drugs their clients are using. Traffickers, dealers, and users themselves have direct contact with these substances at many stages in their distribution. None of these exposure scenarios has been accompanied by worrisome clinical effects. An earnest online video documents (albeit unscientifically) that fentanyl isn’t absorbed through the skin. So what might account for the effects among those passively exposed to fentanyl? Psychological stress presenting as anxiety and, when taken as a whole, mass sociogenic illness, is most likely. This is often described as the nocebo effect, in which the thought of an exposure causes the expected adverse effect, even if a substance is inactive. This is essentially the opposite of the more well-known placebo effect. There are valid reasons for concern about exposure to fentanyl-containing products, although most of them are theoretical. Fentanyl and its analogs are exceedingly potent — small doses can lead to life-threatening toxicity. However, fentanyl is not volatile, meaning that the powdered drug, left undisturbed, can’t cause harm. Even following the use of aerosolized carfentanil to end the Moscow theater siege in 2002, in which more than 100 people died of carfentanil poisoning, rescuers wearing limited or no personal protective equipment are seen in photographs and footage carrying the injured and dead from the premises. Passive toxicity makes even less sense in conventional drug-use settings where other individuals are present and unaffected. Despite newer guidance that urge a more rational approach to the risks of passive fentanyl exposure from the White House Office of National Drug Control Policy, the National Institute of Occupational Safety and Health, the American College of Medical Toxicology, the Interagency Board, Customs and Border Protection, and reviews by other expert groups, apprehension continues to grow with each alleged passive fentanyl poisoning event. As fentanyl analogues are increasingly found in heroin, as well as in other substances such as crack cocaine and synthetic cannabinoids such as K2, we hope that law enforcement personnel, prehospital care providers, and others will grow increasingly more comfortable with the limited risks of passive fentanyl exposure and offer appropriate evaluation of patients without the undue burden of concern for potential self-poisoning. The latest recommendations are reasonable. They nicely communicate the known and potential risks and provide sensible risk-mitigation strategies. For example, anyone who may come into contact with a product believed to contain fentanyl or its analogs should wear gloves — and wash hands before eating or touching the mouth or nose. It also makes sense not to enter an environment that appears risky, such as one in which powder is seen in the air, but if that must be done, donning appropriate high-level respiratory protection should be undertaken. Individuals passively exposed to fentanyl and its analogues who do not display signs consistent with opioid poisoning could likely avoid an emergency department visit unless other concerns arise. Naloxone, an effective antidote for fentanyl poisoning, should available if a responder to an opioid overdose somehow becomes a victim. There’s no question that fentanyl and its analogues can produce life-threatening effects. At the same time, it is important to respect the tenets of medical toxicology that require a sufficient dose delivered by an appropriate route, the production of consistent clinical findings, reasonable exclusion of alternative explanations, and analytical confirmation consistent with clinical poisoning. None of those tenets have been satisfied for passive poisoning by fentanyl or related products. Lewis S. Nelson, M.D., is professor and chair of the Department of Emergency Medicine and director of the Division of Medical Toxicology at Rutgers New Jersey Medical School. Jeanmarie Perrone, M.D., is professor of emergency medicine and director of the Division of Medical Toxicology at the University of Pennsylvania Perelman School of Medicine. This article is reproduced with permission from STAT. It was first published on December 21, 2018. Find the original story here.